In 1997, during UFO's hiatus, Mogg and Way, under the moniker Mogg/Way, released a couple of albums, Edge of the World and Chocolate Box. In 2002, he was in a side project, $ign of 4, featuring Cosmosquad members Shane Gaalaas on drums and Jeff Kollman on guitar, respectively. Kollman had earlier been the guitarist and co-writer on Mogg/Way's Chocolate Box. In late 2003, having regained the rights to the UFO name from Schenker, Mogg spoke with Pete Way and Paul Raymond, and ended up having a reunion tour which later brought the band back for good, with newly hired American guitarist Vinnie Moore. UFO have since released six more albums, the latest being the 2017 covers album The Salentino Cuts. Phil Mogg was a junior boxing champion in North London before his music career. He has been married to Emma Mogg, a former page three girl since 2006 and currently resides in Brighton, England. He is the uncle of Nigel Mogg, former bassist of The Quireboys. 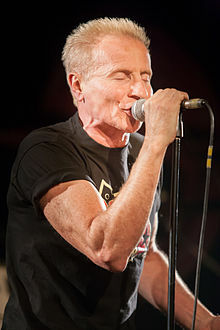 ^ "UFO's PHIL MOGG To Step Down After 50th-Anniversary Tour: 'This Is The Right Time For Me To Quit'". Blabbermouth.net. 28 May 2018. Retrieved 24 June 2018. ^ "Artist Chart History - UFO". Billboard charts. Retrieved 24 June 2018. ^ "UFO Discography". Official Charts Company. Retrieved 24 June 2018. ^ "Phil Mogg: I Am Leaving UFO". Ultimate-Guitar.com. 29 May 2018. Retrieved 29 May 2018. ^ "Phil Mogg What's Your Sign?". BraveWords.com. 31 July 2002. Retrieved 10 April 2019. This page is based on the Wikipedia article Phil Mogg; it is used under the Creative Commons Attribution-ShareAlike 3.0 Unported License (CC-BY-SA). You may redistribute it, verbatim or modified, providing that you comply with the terms of the CC-BY-SA.